Carpal tunnel syndrome (CTS) is a condition brought on by increased pressure on the median nerve at the wrist. In effect, it is a pinched nerve at the wrist. Symptoms may include numbness, tingling, and pain in the arm, hand, and fingers. There is a space in the wrist called the carpal tunnel where the median nerve and nine tendons pass from the forearm into the hand (see Figure 1). 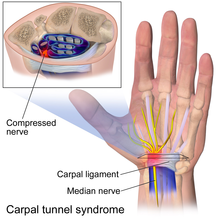 Carpal tunnel syndrome happens when pressure builds up from swelling in this tunnel and puts pressure on the nerve. When the pressure from the swelling becomes great enough to disturb the way the nerve works, numbness, tingling, and pain may be felt in the hand and fingers. Health problems or illnesses that can cause arm pain or swelling in the joints and soft tissues in the arm, or reduce the blood flow to the hands. These include obesity, rheumatoid arthritis, diabetes, lupus,hypothyroidism, and multiple sclerosis. Being female. Women between the ages of 40 and 60 have the highest risk. Pregnant women near the end of their pregnancies often have short-term symptoms. Women taking birth control pills, going through menopause, or taking estrogen are also thought to be at risk. Hand and wrist movements and activities that require repeated motions, especially in awkward positions. Smoking. It may contribute to carpal tunnel syndrome by affecting the blood flow to the median nerve. Broken wrist bones, dislocated bones, new bone growth from healing bones, or bone spurs. These can take up space in the carpal tunnel and put more pressure on the median nerve. Tumors and other growths (such as ganglions). These uncommon causes of carpal tunnel syndrome are usually benign. Normal wear and tear of the tissues in the hand and wrist caused by aging. If you find yourself at risk for Carpal Tunnel Syndrome or in extreme wrist pain, call Neuropax Clinic today at 314-434-7784 or visit www.neuropaxclinic.com for more information. Don't live with the pain. Fix your Carpal Tunnel Syndrome today. What Can I Do About My Chronic Migraine Pain? What Can I Do About My Chronic Migraine Pain? Everyone gets a headache from time to time. Hangovers, lack of sleep, stress, and other factors can all lead to a common headache. But what if you don't have a "common headache"? Many people suffer from what are referred to as Chronic Migraine Headaches. That's when the headaches appear on a dialy or cintinual basis, and can ruin your life if left untreated. These migraine headaches present themselves as intense, repeated pain, with increased sensitivity. There are 180 different types of defined headaches. 30 million people in the US suffer from chronic migraines in some form. Many patients have centralized headaches that respond well to medicines. However, many people have headaches that are debilitating and don't respond well to current available pharmaceuticals. Do You Have Sports Injury Pain? If you ever played a sport competitively, you probably have some degree of sports-injury related pain. There+'s no embarassment to it, it's just the way of life. If you spend your youth running into people, you will feel it as you age. Sports related injuries do not discriminate based on age or ability. Athletes, from professionals to weekend warriors are vulnerable to chronic pain as the result of injuries. Persistent pain can stall progress with rehab/physical therapy and keep individuals from returning to their activity, in some cases disabling them from other daily activities. If you continue to experience persistent chronic pain after a sports injury, peripheral nerve surgery may relieve pain and help you return to your sport and other normal activities that may have been affected. At Neuropax Clinics, we treat athletes for a variety of chronic pain conditions related to peripheral nerve damage. While we are not focused on the primary treatment of sports related injuries, we can offer you hope for relief of pain that has not responded to traditional treatments. Most cases of CTS are of unknown cause. Carpal tunnel syndrome can be associated with any condition that causes pressure on the median nerve at the wrist. Some common conditions that can lead to CTS include obesity, oral contraceptives, hypothyroidism, arthritis, diabetes, prediabetes (impaired glucose tolerance), and trauma. Carpal tunnel is also a feature of a form of Charcot-Marie-Tooth syndrome type 1 called hereditary neuropathy with liability to pressure palsies. Other causes of this condition include intrinsic factors that exert pressure within the tunnel, and extrinsic factors (pressure exerted from outside the tunnel), which include benign tumors such as lipomas, ganglion, and vascular malformation. Carpal tunnel syndrome often is a symptom of transthyretin amyloidosis-associated polyneuropathy and prior carpal tunnel syndrome surgery is very common in individuals who later present with transthyretin amyloid-associated cardiomyopathy, suggesting that transthyretin amyloid deposition may cause carpal tunnel syndrome. The median nerve can usually move up to 9.6 mm to allow the wrist to flex, and to a lesser extent during extension. Long-term compression of the median nerve can inhibit nerve gliding, which may lead to injury and scarring. When scarring occurs, the nerve will adhere to the tissue around it and become locked into a fixed position, so that less movement is apparent. Normal pressure of the carpal tunnel has been defined as a range of 2–10 mm, and wrist flexion increases this pressure 8-fold, while extension increases it 10-fold. Repetitive flexion and extension in the wrist significantly increase the fluid pressure in the tunnel through thickening of the synovial tissue that lines the tendons within the carpal tunnel. The international debate regarding the relationship between CTS and repetitive motion in work is ongoing. The Occupational Safety and Health Administration (OSHA) has adopted rules and regulations regarding cumulative trauma disorders. Occupational risk factors of repetitive tasks, force, posture, and vibration have been cited. The relationship between work and CTS is controversial; in many locations, workers diagnosed with carpal tunnel syndrome are entitled to time off and compensation. Some speculate that carpal tunnel syndrome is provoked by repetitive movement and manipulating activities and that the exposure can be cumulative. It has also been stated that symptoms are commonly exacerbated by forceful and repetitive use of the hand and wrists in industrial occupations, but it is unclear as to whether this refers to pain (which may not be due to carpal tunnel syndrome) or the more typical numbness symptoms. A review of available scientific data by the National Institute for Occupational Safety and Health (NIOSH) indicated that job tasks that involve highly repetitive manual acts or specific wrist postures were associated with incidents of CTS, but causation was not established, and the distinction from work-related arm pains that are not carpal tunnel syndrome was not clear. It has been proposed that repetitive use of the arm can affect the biomechanics of the upper limb or cause damage to tissues. It has also been proposed that postural and spinal assessment along with ergonomic assessments should be included in the overall determination of the condition. Addressing these factors has been found to improve comfort in some studies. A 2010 survey by NIOSH showed that 2/3 of the 5 million carpal tunnel cases in the US that year were related to work. Women have more work-related carpal tunnel syndrome than men. Speculation that CTS is work-related is based on claims such as CTS being found mostly in the working adult population, though evidence is lacking for this. For instance, in one recent representative series of a consecutive experience, most patients were older and not working. Based on the claimed increased incidence in the workplace, arm use is implicated, but the weight of evidence suggests that this is an inherent, genetic, slowly but inevitably progressive idiopathic peripheral mononeuropathy. Repetitive Strain Injuries are annoying and costly. Everything from Carpal Tunnel to Foot Drop can be caused by just repeating the same motions repeatedly, causing stress on the joint in a way that it's not meant to be used. While companies can adjust workstations and reassign tasks to reduce employee injuries, treating an injury once it occurs is not nearly as easy. For instance, computer-related repetitive strain injury, caught early enough, can be remedied or controlled with physical therapy, education about posture and body mechanics, and sometimes, time away from the keyboard. But if an employee keeps working without making such changes, he or she can wind up so disabled that performing even simple tasks like cooking, gardening, picking up a baby, or carrying groceries becomes difficult. Even if the problem never reaches that point, some employees are never able to return to their full capacity. Most often, doctors tell patients to get adequate rest, take frequent breaks, do stretching exercises, vary their tasks if possible, and change the way they sit or move -- for instance, periodically hold or reach for something with a different hand. Some physicians recommend anti-inflammatory medication and using ice or heat on the injured area until the pain subsides. Many also refer patients for a range of alternative treatments, including chiropractic or osteopathic manipulation,acupuncture, or a method called myofascial release, which focuses on the soft tissue. Depending on the injury, surgery can help -- for instance, carpal tunnel release surgery in the wrist takes pressure off the medial nerve in order to preserve nerve function. Since repetitive strain injuries are essentially the result of doing more than the body can handle, many doctors say the best chance for recovery lies in eventually strengthening the body's tissues. How long does it take? That's the rub. Strengthening the joint or surrounding areas can help with repetitive injuries, but sometimes, surgery is required. If strengthening the area hasn't helped, Dr. Robert Hagan of Neuropax Clinic can help. To learn more about Repetitive Strain Pain, or any nerve related surgery, visit www.neuropaxclinic.com or call 314-434-7784 to make an appointment. Don't live with repetitive strain pain any longer. Migraines can ruin your life. They take away full days from your life, debilitating and stopping you from living your life how you want to. What if there was a way to minimize or even eliminate your Chronic Migraine Pain? Nerve surgery for your migraines couls be your answer. There are 180 different types of defined headaches. Many people have headaches from time to time, but if you experience them on a daily or continual basis, your headaches may fall into the category of Chronic Migraine Headache. 30 million people in the US suffer from chronic migraines in some form. Many patients have centralized headaches that respond well to medicines. However, many people have headaches that are debilitating and don't respond well to current available pharmaceuticals. For more information, visit www.neuropaxclinic.com or call our office at 314-434-7784 today to make an appointment. So, you're experiencing wrist pain, and you've been diagnosed with Carpal Tunnel Syndrome. You'd like to know "Will I Need Carpal Tunnel Surgery"? and "What Does Carpal Tunnel Surgery Entail?" We'll go through a few of the key points to give you an idea what to expect. During open carpal tunnel release surgery the transverse carpal ligament is cut, which releases pressure on the median nerve and relieves the symptoms of carpal tunnel syndrome. After surgery, the hand is wrapped. The stitches are removed 10 to 14 days after surgery. The pain and numbness may go away right after surgery or may take several months to subside. Try to avoid heavy use of your hand for up to 3 months. When you return to work depends on whether the dominant hand (the hand you use most) was involved, what your work activities are, and how much effort you put into rehabilitative physical therapy. If you have surgery on your nondominant hand and do not do repetitive, high-risk activities at work, you may return to work within 1 to 2 days, although 7 to 14 days is most common. If you have surgery on your dominant hand and do repetitive activities at work, you may require 6 to 12 weeks for a full recovery before you can return to previous work duties. Physical therapy may speed your recovery. Most people who have surgery for carpal tunnel syndrome have fewer or no symptoms of pain and numbness in their hand after surgery. The risk and complication rates of open surgery are very low. Major problems such as nerve damage happen in fewer than 1 out of 100 surgeries (less than 1%).2 There is a small risk that the median nerve or other tissues may be damaged during surgery. After open surgery, recovery may be slower than after endoscopic surgery. And there may be some pain in the wrist and hand. You may also have some tenderness around the scar. There are also the risks of any type of surgery, including possible infection and risks of general anesthesia. But most open carpal tunnel surgery is done with local anesthesia or regional block rather than with general anesthesia. The main takeaway is that Carpal Tunnel Surgery can eliminate the pain and numbness that is felt in the wrist and help you regain all of the mobility that you previously enjoyed. For more information about Carpal Tunnel Syndrome visit www.neuropaxclinic.com and call 314-434-7784 for an appointment. Don't live with the pain any longer than you have to. Migraines are a scourge that can ruin your quality of life if not treated properly. Luckily, there are treatments available if these symptoms of a St Louis Mmgraine that may need surgery sound familiar to you. If you see these symptoms or are dealing with this pain, call Neuropax Clinic in St. Louis at 314-434-7784 to schedule an appointment, and visit www.neuropaxclinic.com for more information. Sometimes, cubital tunnel syndrome results from abnormal bone growth in the elbow or from intense physical activity that increases pressure on the ulnar nerve. Baseball pitchers, for example, have an increased risk of cubital tunnel syndrome, because the twisting motion required to throw a slider can damage delicate ligaments in the elbow. If you have any of these symptoms, your doctor may be able to diagnose cubital tunnel syndrome by physical examination alone. He or she also may order a verve conduction study and a test called electromyography. Electromyography is a procedure in which electrodes placed into muscles and on the skin measure the health of muscles and the nerve cells that control them, to confirm the diagnosis, identify the area of nerve damage, and determine the severity of the condition. How is Carpal Tunnel Syndrome Treated in St. Louis? Dealing With a St Louis Sports Injury? Sports related injuries do not discriminate based on age or ability. Athletes, from professionals to weekend warriors are vulnerable to chronic pain as the result of injuries. Persistent pain can stall progress with rehab/physical therapy and keep individuals from returning to their activity, in some cases disabling them from other daily activities. If these symptoms seem familiar, contact Neuropax Clinic today at www.neuropaxclinic.com or call 314-434-7784 for an appointment. Occipital Neuralgia Headaches - What Causes Them? We are seeing an epidemic of patients with the same complaint - headaches that have popped up out of nowhere. The first question I ask is "how much time do you spend staring down at your phone per day?" That's because "cell phone neck" is becoming the newest ailment that is affecting people. Its real name is Occipital Neuralgia. Occipital neuralgia, also known as C2 neuralgia, is a medical condition characterized by chronic pain in the upper neck, back of the head and behind the eyes. These areas correspond to the locations of the lesser and greater occipital nerves. Basically, the occipital nerves are being impinged, because people are holding their heads down at an angle that isn't natural. Every inch that you crane your head downwards to look at your phone or tablet puts an additional 60 pounds of pressure on your vertebrae. This additional stress can cause swelling in the tissues and pinch the nerves, causing your headaches. If you find that you're suffering from these headaches, and are just now realizing that this is how you read your phone, or if you're reading this article ON your phone and are just now realizing why you have a headache, giive us a call at 314-434-7784 to make an appointment to come in to see Dr. Robert Hagan about your headaches. There are several methods to cure this condition before surgery, and you can explore them all before that option. Learn more about occipital neuralgia here and visit www.neuropaxclinic.com to learn more about the practice. Contact Neuropax Clinic today to set up a consultaion about your headaches. Call 314-434-7784 or visit www.neuropaxclinic.com today! We get a lot of questions about Thoracic Outlet Syndrome, and how we can help with it. The first step would be to let you know what the syndrome actually is. Thoracic outlet syndrome (TOS) is a condition caused by compression of nerves or blood vessels in the thoracic outlet, the area between the base of the neck and the armpit, including the front of the shoulders and chest. Vascular. This can be a compression of the artery and vein. Neurogenic. The nerves become compromised from an extra cervical rib, present at birth. Disputed or painful form. There is no neurological deficit but patients experience neurological symptoms and pain. Typically these patients’ electrodiagnostic studies (EMG / NCV) are normal, but they complain of pain. But how do you know if this is the cause of your pain? There are several symptoms of the problem. Physical therapy with careful nerve stretching movements performed by a qualified and experienced physical therapist with experience treating TOS. Injections with nerve blocking agents to suppress pain and reduce swelling and compression. Acupuncture. Some patients with TOS have found relief using acupuncture. Thoracic outlet syndrome (TOS) is a group of problems that occur when there is irritation, compression, or injury of the nerves and/or blood vessels (arteries and veins) in the lower neck and upper chest area. Thoracic outlet syndrome is named for the area (the thoracic outlet) between your lower neck and upper chest where this grouping of nerves and blood vessels is found. But how do you know if this is what you're suffering from? Here are the symptoms of Thoracic Outlet Syndrome. The pain of TOS is often confused with angina, where chest pain is caused by a lack of oxygen to the heart muscle. The difference is that the pain of TOS doesn't increase when walking, while this agitates and increases pain from angina. TOS increases in pain when the arm in question is raised, while angina doesn't. What symptoms you have can also help determine where your TOS is located. Different locations have different pains associated with them. While TOS generally only affects the nerves, it can also attack the veins and arteries. In every type of TOS, though, the thoracic outlet is narrowed, with scar tissue forming around the area. If you experience any of these symptoms, please call Neuropax Clinic today in St. Louis to setup an appointment to talk to us. Call us at 314-434-7784 to take the first step to healing your Thoracic Outlet Syndrome. The thoracic outlet is a small space just behind and below your collarbone. The blood vessels and nerves that serve your arm and shoulder are located in this space. Thoracic outlet syndrome (TOS) is the presence of a mixture of hand, arm, shoulder and neck symptoms. All of these symptoms are due to pressure (or compression) against the nerves (called the brachial plexus) or blood vessels within the scalene triangle at the thoracic outlet. Ninety-five percent (95%) of all cases of TOS are Neurogenic, which is compression of the nerves to the arm and shoulder. Venous TOS occurs only 3 to 4 percent of the time and is due to obstruction or clotting of the main vein to the arm, the subclavian vein. Arterial TOS, is the rarest type, occurring in only 1 percent of cases, and it is due to disease in the artery leading to the arm, the subclavian artery. Almost all cases of arterial TOS are associated with an extra rib (cervical rib) or an abnormal first rib. The common symptoms depend on which structure is being compressed. Neurogenic TOS (nTOS), the symptoms are pain, numbness, tingling, and/or weakness in the arm and hand. Also common is a tired feeling in your arm, which is made worse by working with your arms raised over your head. Neck pain and headaches in the back of your head are also frequent symptoms. Another common occurrence is pain that starts in your shoulder and runs down your arm, as well as pain in your fingertips. One can even experience facial pain, jaw pain, ear pain and pain on the front of your chest. Unfortunately, the symptoms of neurogenic TOS can be vague and non-specific. Venous TOS (vTOS) is distinguished by swelling in your entire arm, plus pain and dark discoloration. Arterial TOS (aTOS) presents with pain, coldness, and a pale discoloration of the hand. Cramps occur when using the arm for activity. Neurogenic TOS is most often the result of neck trauma such as a whiplash injury. Motor vehicle accidents, traction injuries to shoulder, slipping and falling on floors or ice, blunt injury to base of neck or top of shoulder, or repetitive stress from working on assembly lines are the common causes. The symptoms are due to trauma and scar tissue formation in; neck muscles (called scalene muscles) and the nerves (brachial plexus). Congenital deformities of the first rib or having an anomalous cervical rib or band significantly increases the risk of acquiring this condition. Ultimately, the cause is compression and tethering of the brachial plexus nerves at the thoracic outlet. Venous TOS is commonly due to strenuous use of the arm and shoulder. Its underlying cause is congenital narrowing of the space through which the major arm vein (subclavian vein) passes from the shoulder area into the heart. Arterial TOS is caused by a narrowing in the main artery to the arm (subclavian artery), usually secondary to a congenital extra rib (cervical rib) or to an abnormal first rib. Once the artery has been narrowed, one of two things will occur. The artery may enlarge, forming an aneurysm just beyond the narrowing, and a clot will form in the wall of the aneurysm; or the artery may remain narrowed and a clot will form inside the artery just beyond the narrowing. The danger of the clot is that pieces of it will break off (called emboli) and travel down the arm to block the circulation to your hand. When this occurs, the hand becomes cold, numb, painful, and discolored and you are in danger of losing your hand. Treatment to restore circulation is essential. How is thoracic outlet diagnosed? Diagnosing TOS can be complex. It begins by your physician asking you a series of questions to find out your symptoms, the distribution of these symptoms and and how the symptoms began. Depending on your symptoms, the doctor will be able to tell if you might have a nerve, vein, or artery compression. An appropriate physical examination will be beneficial in determining your diagnosis as well. It is not uncommon that patients have seen several physicians and have been evaluated for cervical neck problems and shoulder problems prior to the referral for evaluation of thoracic outlet syndrome. For neurogenic TOS, your physician will have you perform a number of provocative maneuvers. These consist of putting your neck and arms in different positions of stress to try to reproduce your symptoms. Other physical findings include tenderness in certain places in your neck, chest, or arms. New technologies such as 3-Tesla MR neurography are helpful in establishing level of injuries and anomalous anatomy and may be requested in addition to traditional xrays. For venous TOS, physical examination consists primarily of noting swelling in your arm and prominent veins seen just under the skin at the spot where your shoulder joins your chest. In arterial TOS, physical exam often finds the pulse at your wrist is diminished or absent. Your hand may have a pale color compared to your pink, good hand. Venous and arterial TOS are best diagnosed with the aid of specific tests, venography for venous TOS and pulse volume or arteriography for arterial TOS. Your particular treatment will depend on the type of TOS you have. Determined by your symptoms, physical examination and test results. Neurogenic (nTOS) is initially treated with physical therapy. The basic therapy methods include stretching exercises of your neck, posture correction, learning to avoid specific movements that bring on or aggravate your symptoms, and modifying your work site when appropriate. While some therapists may suggest strengthening exercises, most patients with neurogenic TOS are made worse by strengthening exercises. Treatment with a therapist for a few weeks is usually followed by a home exercise program, which you continue on your own for at least several more weeks. The doctor may also prescribe medications such as muscle relaxants, non-steroidal anti-inflammatory drugs such as aspirin or ibuprofen, pain relievers, or steroids. In addition, some patients get relief by applying moist heat or massaging and stretching the affected area. When early conservative therapies are failing and there are significant painful symptoms, a diagnostic and/or therapeutic injection may be utilized. This involves an ultrasound guided injection that has numbing agents and steroid. Our technique can give significant temporary relief or can sometimes actually resolve the condition. Further, we have developed novel techniques that utilize our biologic therapeutics. Candidates are determined by responses to initial diagnostic injections and the symptoms they are experiencing. When treatment begins in the early stages of neurogenic TOS, a majority of patients improve with the measures listed above. However, if your nTOS symptoms do not improve with these measures, and if your symptoms are interfering with sleep, work, recreation, or activities of daily living, more aggressive treatment may be recommended. The surgeon may recommend surgical decompression. Surgery for nTOS involves removing certain muscles in your neck and cleaning scar tissue off the nerves of the brachial plexus. The anterior and middle scalene muscles are the muscles making the scalene triangle in the neck at the thoracic outlet. These muscles are a source of the pathology and injury to them will cause compression to the brachial plexus nerves. There are many redundant muscles in the neck, allowing for us to release or resect one or both of these muscles. Additionally, the nerves at this level need to be released from scar tissue or fibrosis that have formed around them. This encasing tissue is much like shrink-wrap and causes both compression and tethering of the nerve. Releasing this tissue relieves compression and re-establishes the much needed gliding surfaces of these nerves. Resection of the first rib is unnecessary in nTOS except in the rare case (<1%) of a cervical rib or first rib anomaly. Modern studies show there is no difference in outcomes, which advocates for not resecting a normal first rib. Resection of the first rib is associated with a higher rate of complications and higher rates of post-operative chronic pain. Further, without the rib resection the invasiveness of the surgery is less and the recovery is easier. In addition, surgery does not always relieve the symptoms of neurogenic TOS. Our success rate is currently 80 to 90%. Larger studies evaluating outcomes from surgery for neurogenic TOS demonstrate that only up to 70 percent of patients have improvement in their symptoms, while 30 percent may feel no better or worse. We feel that our success rate is higher based upon rigorous patient selection and because we rarely recommend the first rib resection. Venous TOS is not treated with physical therapy. Rather, the clot in the vein is initially treated with clot dissolving medication (called thrombolysis), with blood thinners (anticoagulants), or sometimes treated by surgically opening the vein and removing the clot. Once the clot has been removed, your surgeon may recommend that the first rib be removed so that the narrow space through which the vein passed can be enlarged to prevent the vein from clotting again. If the vein is badly narrowed, the narrow spot can be widened by having a balloon stretch out the vein, a procedure called an angioplasty. In some instances, the vein will be repaired operatively, at the time of the rib removal, with a patch (made from another vein) or with replacement of the diseased segment of vein. Arterial TOS is treated in a very different way. If the subclavian artery in your thoracic outlet has become damaged by pressure, your vascular surgeon must repair the artery or replace it with an arterial graft. The replacement graft may be a vein from another part of your body or a plastic artery substitute. In addition to fixing the damaged artery, the abnormal rib must be removed to prevent the artery from being damaged again. Your vascular surgeon can perform all of this in one operation. You can improve your recovery from TOS by practicing good posture, regularly stretching your chest muscles and the muscles in the front of your next, strengthening the muscles of your upper back and posterior shoulder, and losing weight if you are overweight. Also, if you are prone to TOS, it is wise to avoid repetitive lifting of heavy objects over your head. Repetitive tasks involving: throwing, gripping, pronation (turning your hand to a palm down position), and sudden extension at the elbow can produce injury resulting in compression of the median nerve at the elbow and forearm level. Weight lifting may result in building muscle mass and can lead to nerve compression. Trauma to the upper forearm may also result in scarring and can induce compressive neuropathies at and around the elbow. Your own inherent anatomy may be a variant that makes you vulnerable to this condition. Further, it is common to be predisposed to this nerve compression if you are diabetic. Diagnosing this condition is very dependent upon the clinical evaluation and is often missed by electro-diagnostic studies ( nerve conduction, EMG). The median nerve arises from the cervical nerve roots C6 to T1 in the neck. After leaving the brachial plexus and crossing the shoulder it passes down the medial aspect of the arm, crosses the elbow and enters the forearm. Median nerve compression in the elbow area can result in two conditions: pronator syndrome and anterior interosseus nerve syndrome. It is not uncommon for both conditions to be present at the same time. Pronator syndrome produces symptoms of aching of the proximal forearm, elbow and distal arm (just above elbow). This aching may be aggravated by forceful use of the extremity, especially involving pronation. Sensory loss in the fingers and palmar components of the median nerve distribution and weakness or clumsiness in the hand are often noted, especially in the thumb and index finger. Symptoms can be confusing with those seen in carpal tunnel syndrome. It is actually more common for proximal median nerve compression and carpal tunnel syndrome to both be present. This is considered a double crush phenomenom which is when the same nerve is pinched at more than one level along its course. In pronator syndrome, night pain is less common (but does occur) while carpal tunnel syndrome often wakes patients with complaints of aching and numbness in the hands. The physical examination may reveal tenderness and a Tinel sign over the pronator teres muscle. Weakness, if present, may involve the index finger, thumb flexion and pinch strength. Atrophy in the thenar muscles (base of thumb in palm) may be noted in advanced cases. Loss or decreased sensibility of the thumb and index/long fingers are consistent with both proximal median nerve compression and carpal tunnel syndrome. Loss of sensation and/or pain in the palmar area on the thumb sites is suggestive of pronator syndrome. Provocative (exertional) tests on exam can be helpful in eliciting signs of pronator syndrome. Plain x-rays are helpful to rule out a bony supracondylar process in the distal humerus or other post traumatic or degenerative pathology at the elbow as the cause for compression. Electrodiagnostic studies (EMG/NCS) are rarely conclusive but may be orderd to exclude or identify coexisting pathology. The anterior interosseus nerve (AIN) syndrome as an isolated compression syndrome is more rare. AIN is a branch of the median nerve that branches from the median nerve after it passes through the pronator muscle. The AIN has no cutaneous (skin) sensory component therefore numbness is not associated with this syndrome, it is purely a motor problem. Anterior interosseus nerve syndrome includes complaints of absent or decreased flexion (bending) of the thumb and index finger. For instance, it is difficult to make an OK sign. A weakened index finger-thumb pinch is generally noted as well. The initial treatment for proximal median nerve compressions is conservative. However, if severity and duration of symptoms are significant at the time of initial presentation to the physician, you may require surgery at that point. Anterior interosseus nerve syndrome again is more rare, but usually resolves with time, particularly if it is secondary to minor trauma or irritation to the nerve. However proximal median compression in the diabetic limb usually, ultimately requires surgery and is generally found coexisting with other compressions in the same extremity. If no improvement with time and therapy are noted or if a space occupying lesion/mass is identified on the MRI, surgical release is then recommended. Postoperatively the arm, forearm and elbow are wrapped in a bulky dressing for one week. After this point, flexion and extension exercises are started and slowly progressed. Return to full function and full duty work are fairly consistent but vary based on several factors but particularly the amount of deconditioning at the time of surgery. Laboratory tests and x-rays can reveal diabetes, arthritis, fractures, and other common causes of wrist and hand pain. Sometimes electrodiagnostic tests, such as nerveconduction velocity testing, are used to help confirm the diagnosis. With these tests, small electrodes, placed on your skin, measure the speed at which electrical impulses travel across your wrist. CTS will slow the speed of the impulses and will point your doctor of chiropractic to this diagnosis. For more information on treatments for all nerve problems, visit www.neuropaxclinic.com and call 314-434-7784 to setup an appointment. Many patients have come to me asking about problems with the Proximal Nerve, and how it can be affected and fixed. Here are my thoughts on the nerve and what we can do for you! The prognosis for full recovery is generally very good, however one must consider the amount of deconditioning that was present at the time of surgery. Full recovery may take as long as 6 months even after surgical decompression. If there is severe nerve damage, recovery may take longer and may be incomplete. Risks of the surgery are very rare but include: the persistent symptoms or pain, motor weakness, nerve injury, loss of function, and other generalized surgical risks such as hematoma, seroma or neuroma. For more information on how to treat Poximal Median Nerve Compression, visit www.neuropaxclinic.com and call us at 314-434-7784 to set up an appointment!